Nokia 903 Precious is a concept which is given by Shihuzaan. For your information, Nokia will launch its Windows Phone Mango running handset at Nokia World 2011. I already informed you about the specs of Nokia Ace, Searay and Sabre etc. Now it’s time to spend a few minutes on this fresh concept of Nokia 903 Precious. It is another Windows Phone Powered device. Before moving a head, just have a look at this concept phone. 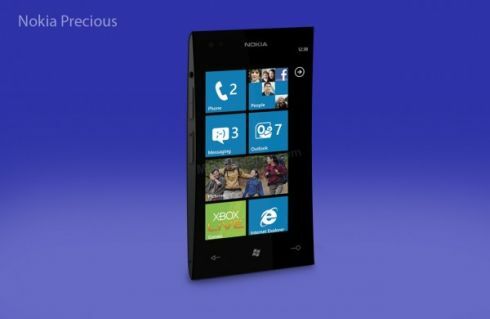 Nokia 903 Precious Windows Phone seems to be a combination of a Windows Phone 7 running Samsung and HTC devices. The specs of this handset are somewhat similar to real Nokia 800 Windows Phone It is powered by a 1.4GHz processor and a 16GB or 64GB internal memory. A well designed 8 megapixel Carl Zeiss camera is available on the back side of this Windows Phone running handset. Best of all, it comes with Near Field Communication Technology which has become a must for high-tech smartphones of this era. The design of it is somehow different from available WP7 devices. First thing that you will notice is the extra curved back and flat front of this gadget. Black color adds some grace to overall design while sharp corners of it also get your attention toward it. There are usual features of Nokia 903 which are already on hand in other WP7 devices such as support to fastest internet explorer, xbox live, messaging and an easy to use interface. Now it’s your turn , you need to tell me whether you like this well-designed Nokia 903 Precious Windows Phone Concept? What other features should be included in this Mango device?